Looking for a bed that works hard so you can rest even harder? That’s the claim with Natural Escape. My Green Mattress has designed a line of products that are meant to offer the ultimate in support, while simultaneously diminishing allergens and unnatural materials so you can rest easy. Founded by a father with a daughter suffering from allergies, the company is dedicated to creating a clean, antibacterial sleep experience for their customers. 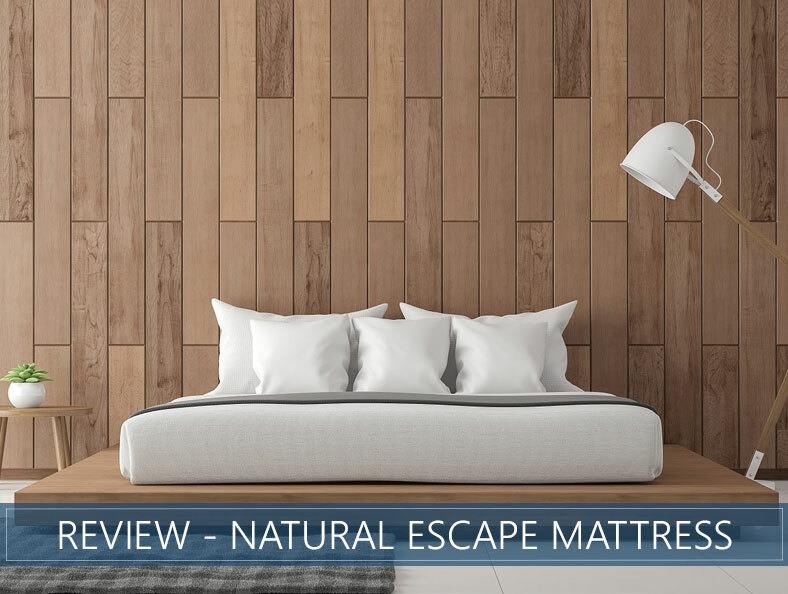 Our analysis of the Natural Escape bed will detail the features and certifications of this more natural bed. You’ll also receive scores based on support, comfort, quality, and more. Scroll down for our comprehensive analysis of this bed. Or skip to the end of this review for our final opinions and scores. Want a hypoallergenic product – The materials in this product are designed to ease allergy sufferers by reducing triggers. This bed holds multiple certifications to ensure shoppers are purchasing a more natural product. Prefer zoned support – The surface is zoned in 3 areas to provide both compression and pushback where your body needs it the most. The midsection should provide ample lumbar support while the head and foot areas should allow a little more sinkage for excellent spine alignment. Prefer a firmer bed – Stomach sleepers and some back sleepers tend to prefer a firmer comfort feel to prevent the hips from sinking. They should be well-served by this firm and supportive bed. Need extra pressure relief – While the zoned comfort should allow for a little more pressure relief in the shoulders, some side sleepers, or those requiring enhanced pressure relief, may find the overall feel to be a little more firm than they might like. If you want to see some other beds, you can take a look at our top 12 list for 2019. Natural Escape is a latex and coil hybrid that is compressed and placed inside a box for easy shipping. The company recommends a flat, solid surface for set-up, which includes foundations or the floor. It is recommended to use a slatted base with the slats no more than 3 inches apart to prevent sagging. The cover is made up of temperature-regulating wool and organic cotton to create a soft feel. A tufted button design reduces the need for adhesive, allowing for a more natural construction. The company warns that the handles on the sides of this bed are meant to aid in rotating the product and may become damaged if used for carrying or transporting. This mattress is 11 inches in height. The top layer is comprised of a 3-inch thick layer of Dunlop Latex. This material is meant to promote pressure relief and a soft transition into the coil support system below. The second layer boasts a Pocketed Coil Spring System. These coils feature 3 zoned areas that should provide more pressure relief in the shoulder and leg areas, with more support in the torso region to prevent sinkage and promote lumbar support and spinal alignment. The perimeter is made up of reinforced coils that should create an even feel across the surface of the bed. This bed features a score of 6.5-7.5 on our comfort scale. This system would indicate a score of 1 is very soft and a score of 10 is very firm. 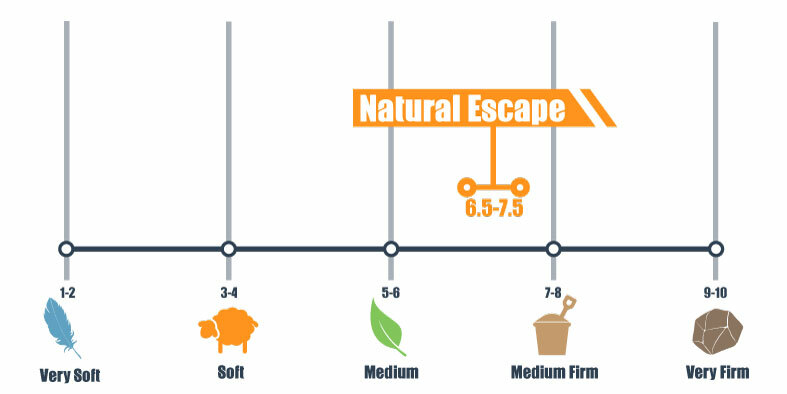 The Natural Escape’s score should come across as medium-firm to firm for most shoppers. Shoppers should remain floating on the mattress, with minimal sinkage and a gentle cradle lightly contouring them while they sleep. The zoned areas of the coil system should allow a little more compression in the head and foot areas with a firmer support in the torso section. Lots of bounce and a quickly reforming latex should allow for easy repositioning to aid combination sleepers. Most stomach sleepers should experience solid support and a neutral spine. These sleepers generally prefer a firmer comfort option, which this item should do well in providing. Back sleepers should feel enhanced lumbar support thanks to the zoned coils. Those who are drawn to a firm feel should enjoy this bed. Most side sleepers prefer a softer comfort level in order to reduce pressure in the hips and shoulders. The shoulder area of this product should allow for a little more sinkage, which may help in this regard. If extra pressure relief is a major priority, however, a softer product might be the way to go. The company does not recommend a specific weight limit. Most shoppers should feel well-supported by the combination of the coils and firmer latex. 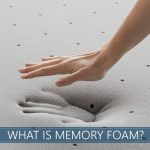 Hybrid beds tend to land somewhere in the middle of bouncy innersprings and dense memory foam products. This item may allow more motion transfer than a typical all-foam bed. However, the latex layer and individually pocketed coils should reduce enough motion transfer to satisfy most shoppers. This bed features reinforced coils around the edges of the bed to promote enhanced edge support. This reinforcement should create a consistent feel from edge-to-edge. Couples should be able to sprawl out on either side of their mattress without feeling like they might roll off. Trial Period – This mattress is offered with a 100-night trial period so you can get a true feel for your new bed. Warranty – A 10-year warranty is included with the purchase of this item. Shipping – The company ships free within the contiguous United States. An additional fee is required to ship to Hawaii, Alaska, or Canada. OEKO-TEX® Certified – The wool inside this product’s cover is certified to have low levels of chemicals or heavy metals. GOTS Certified Organic – The certification earned by the cotton in this item’s cover promises most of the fibers used are organic. GOLS Certified Organic – The latex used in this mattress is certified to contain 95 percent or more organic materials. GREENGUARD Gold Certified – This mattress is certified to contain low VOC emissions. Coils, reinforced edges, zoned comfort, and firm latex combine to create a supportive bed designed to cater to sleepers of all shapes and sizes. Stomach and back sleepers who like a firm feel should enjoy this supportive hybrid bed. Coils and latex offer pushback and pressure relief that is designed to adapt to the sleeper’s weight, position, and movement. Multiple certifications promise a hypoallergenic experience that should reduce allergens to ease allergy sufferers.